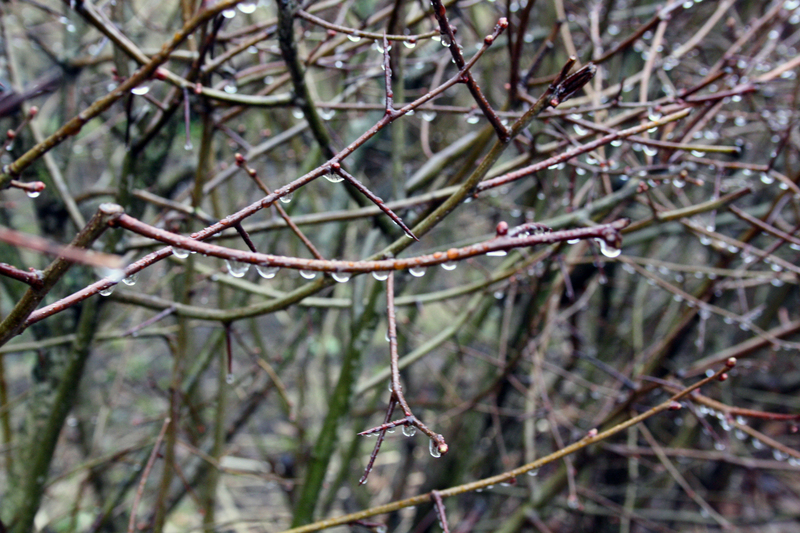 Even more than sunny spring days, I enjoy those overcast days with a slowly drizzling spring rain. Does it mean that I have a plants’ soul? The Finnish year – cycle is structured between the two inactive seasons: the winter and the summer. 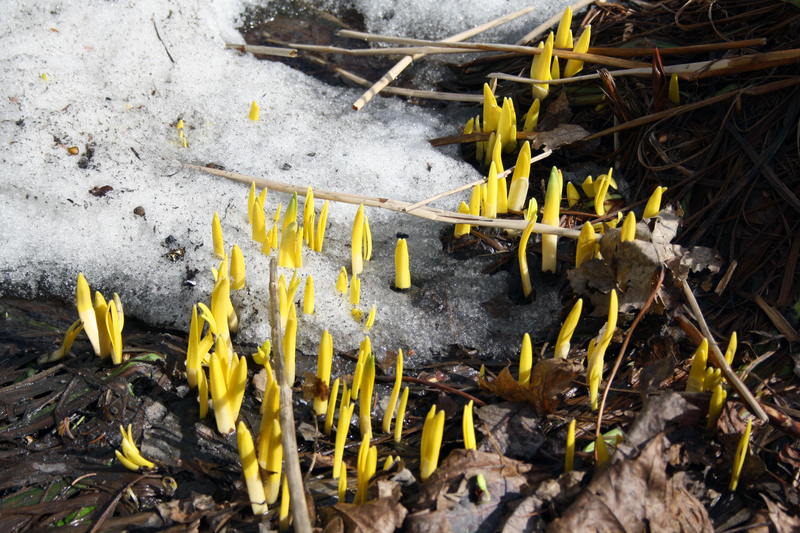 After the long, dark lull of the winter the spring is a rushed burst of energy: in just a few short weeks the nature is turned from bare potential to a full blooming fertile beauty. Each week you hear a new migrant bird, and the amount of light increases day by day, until the darkness is just a memory, easily forgotten. And then you reach summer, the lovely, lazy season of free time, when nothing much happens, and the greatest newsline is a trout – bitten toe. For a delicate mind spring can be depressing too, since it sets you face to face with the inevitability of all life: whether you catch the big rolling wheel or not, life will go on, with or without you. Spring is usually rich with deadlines, whether at work or full moons for planting things or enjoying the newly reborn nature. The elder will bloom only a day (did you collect the flowers for a juice? ) and the sprouting wild vegetables will turn bitter in couple of weeks (did you make the pesto?). The spring rolls on, and meanwhile you might struggle with a pollen allergy, unfixed bike and the continuous daylight that doesn’t let you sleep, and as the only thought have the idea of the summer holiday somewhere ahead, if you just manage a little bit longer. 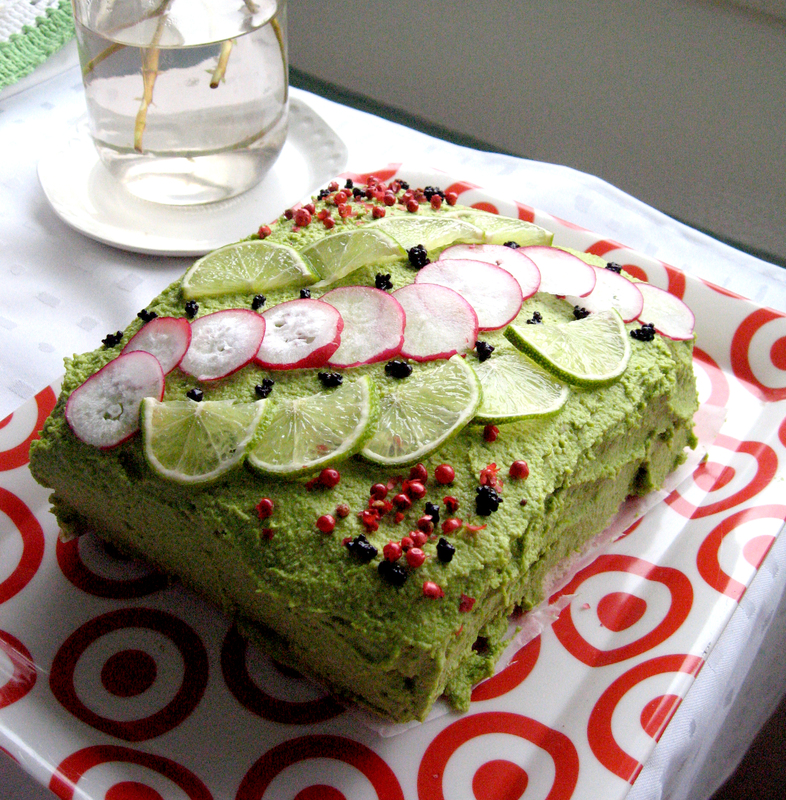 Springtime is also time of festivities of all sorts, and the Finnish traditional delicacy for a graduation party or other family festivity is a sandwich cake, which is a savoury cake made of a bread loaf (!). My friends insisted on having one at their house – warming party. What happened was that on the Eve of First of May, which is a night of great many parties in Finland, I emptied my handbag on my doorstep at 3 am and figured that I’d left my keys inside. The cake was supposed to be ready the following day. I ended up spending the night elsewhere, and in the morning found a big kitchen full of jamming, singing and guitar – playing people. And even if the brunch was rather meagre, only one third of a shop bought pound cake, the music was such soul food that I just couldn’t leave the soaring voices and harmonies of the morning of First of May. So in the end the sandwich cake was assembled of things that I found in my cupboard, in a haste. But everyone loved it. a loaf of bread, and 5 dl oat milk. I threw the peas quickly to boiling water, strained them and blended everything with a hand held blender. I blended everything to a paste with a blender. I blended everything to a paste. For a sandwich cake you need a tin – baked loaf of bread, and it should not be fresh, but dried out a bit. Cut off all the crusts, and slice the bread diagonally into three layers. My loaf was too long to fit in my cake container, so a cut into half and made a square – shaped cake by putting the halves next to each other. Then I filled the cake, and moistened it using oat milk. I used about 5 dl of oat milk for moistening. It is good to start a day before, and let the cake stay in the fridge overnight. The following day put on the icing and the other decorations. My “icing” was a paste made of peas, and it turned out very well, sticky and not runny at all (must be the proteins in peas). 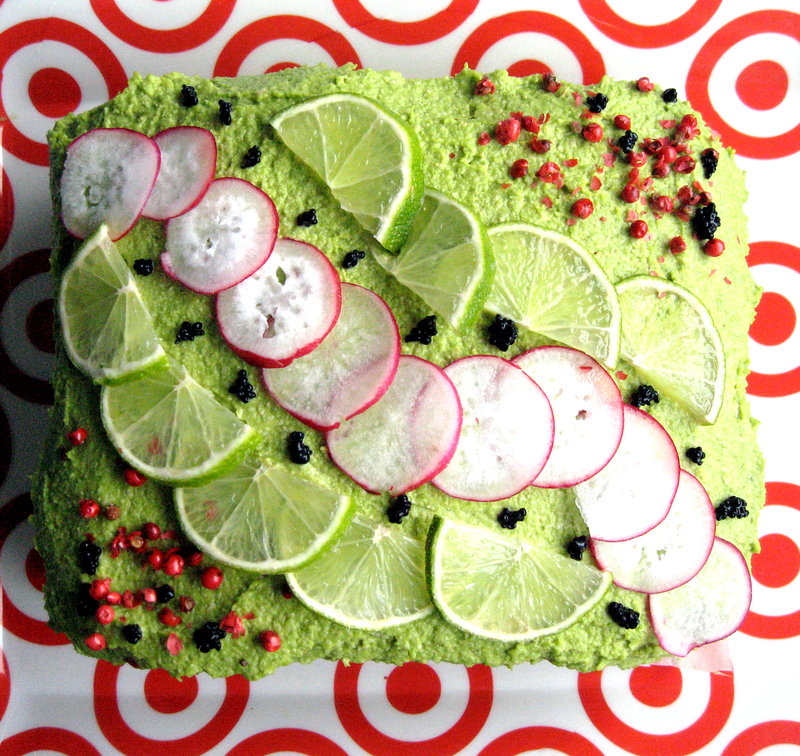 I decorated the cake with lime slices, very thin slices of radish, red peppercorns and pinches of black vegan caviar. 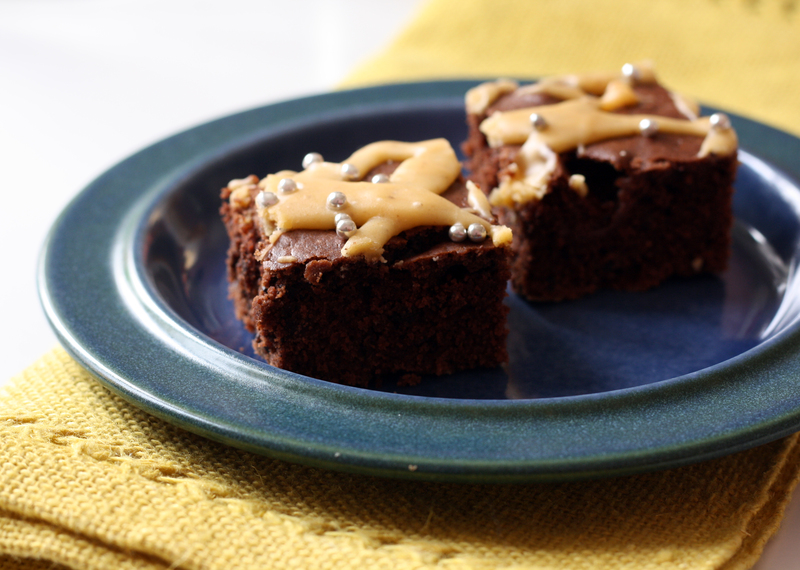 This is another one of those let’s just bake something with whatever ingredients there happen to be at hand – kind of thing. The sea – buckthorns grow quite close to where I’m living and were a result of urban foraging last autumn (me and my Australian guest, in almost total darkness). Sea – buckthorn is extremely rich in vitamin C, and a very challenging berry to pick because of the nasty thorns in the bushes. It is also very, very sauer, almost bitter in taste, and does need a bit of sugar to be truly delicious. Grind the berries through a sieve, to get rid of the seeds, and then mix the remaining paste with powdered sugar. Sprinkle on top of the chocolate cake. I also used some silver cake pearls for a finishing touch. What a strikingly beautiful sandwich cake.You described Finnish spring very beautifully;I do miss that time when the nature awakens again after a long cold winter. Thank you Yaelian! 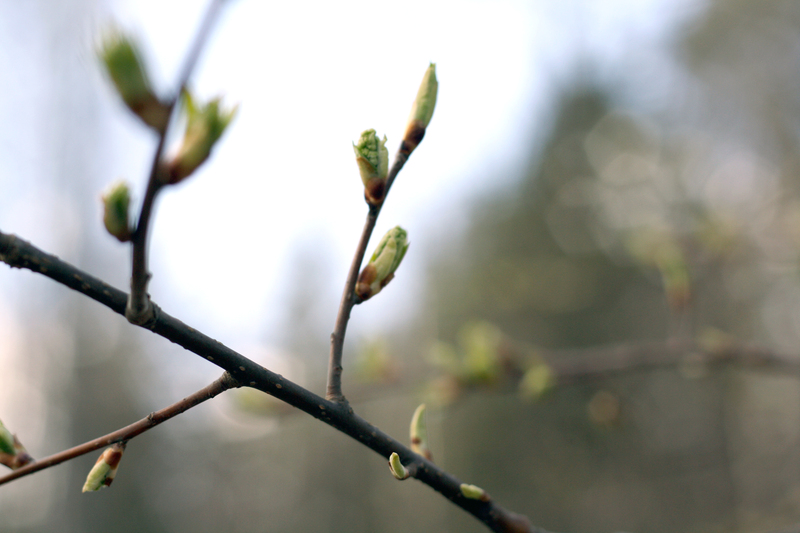 The changes in the four Finnish seasons are always exciting! Thank you Garden Mama! A sandwich cake is a really Scandinavian thing, I don’t think they exist anywhere else. But it’s delicious! The non – vegan versions usually contain piped cream cheese and wild decoration with roses made of salmon, or something like that..
Now you made me drool with that sandwich cake! Weird how some people get depressed when the spring arrives and some – like me – are suddenly so full of energy it’s hard to stay still. You know what’s really weird? There are so many people who don’t like sandwichcakes at all! I too think they are delicious… I’m also having a springtime issue with a really odd sleeping pattern, which due to too much light. This thing with Finland is that it’s always the extremes, you can never relax! Oh that’s so nice to hear.. I’ve been busy with an exciting project! I’ll write about it soon!